I don't believe I ever read the following two books by Robert Lawson growing up. Neither rung any bells for me, although I'm sure I would have enjoyed them (alongside the "We Were There" books. Remember those?) Jonathan, on the other hand, did read both of these books and remembers loving them. I picked them up but didn't think to mention them to Jonathan. Then he found them and was happy to see them. I'm very glad I DID pick them up because I enjoyed both of them thoroughly and am glad that we have them on hand to introduce them to our kids. In case you fall in the Carrie Camp and have not yet read them, allow me the introduction. 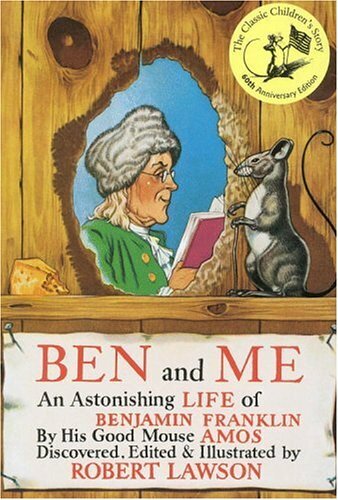 Ben and Me : An Astonishing Life of Benjamin Franklin by His Good Mouse Amos tells the story of Benjamin Franklin's mouse - the genius behind Franklin as it turns out. The book opens up by Lawson explaining that a tiny manuscript was discovered in a small chamber beneath a bedroom hearthstone in Philadelphia. The manuscript was then verified to have been written by a mouse and that mouse's name is Amos. Both of these titles, both Ben and Me and Mr. Revere and I are fun and clever. I think they do a marvelous job at drawing children into an exciting time in America's history in a creative and playful way - through the eyes of mouse and horse. I look forward to enjoying these books with my children many times over in the coming years and am happy to recommend them to you. Now, I purchased both of these books for myself and then I noticed that they were published by Little, Brown. (By the way, this is the same publisher who also gave us the gift of Tumtum & Nutmeg.) I e-mailed them about these titles, as they have just recently re-released them for a new generation of young readers. They generously offered a giveaway of these two titles. Ohhh, but it gets better. I have 5 sets of these books to give away! That's right - 5 of you will win a copy of both of these titles! To win? Simply leave a comment below! This contest is open to U.S. Residents only and will be open through Wednesday, May 19th. If you are a regular subscriber/follower of Reading to Know, leave an extra comment. I like rewarding those who are around all the time. Otherwise - just enjoy with Little, Brown compliments and mine as well! Oooh, pick me, pick me!! We are studying American History next year and these will be PERFECT!! Comment #2! : ) Thanks for this gret offer! I can't believe I never read these - I pretty much devoured historical fiction as a child! My mom read these books to us kids when we were younger. They are on my "to read" list for my kids. He is a great author. (gasp) I want a set! how great! i read your blog on a regular basis! I hope to win a set for my kids! I, too, follow you in my Google reader. Your blog is a great find and our book collection has grown. WOW! Little Brown is so generous! I would love to add this to our library...for my husband and I to read now, and for my children to read in a few years! Me, again! I've just recently found your blog and it's a regular fave of mine! 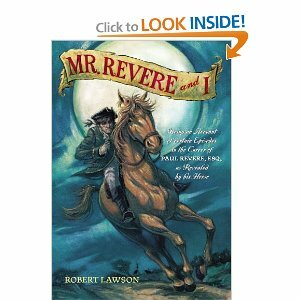 I love Ben and Me, but I have never read Mr. Revere and I.
I am a regular follower. This looks like a very cute book! I'd love to win! My daughter would love these books. She got into books about presidents/historical figures after she experienced books by David A. Adler. I am a follower too. Love your blog. Such a cute concept! I'd love to win this. Looks awesome! Count me in. I'm a long time follower :). Fun books! My kiddos would love them. My, how generous of Little, Brown! I am a huge follower on my google reader and also read many of your recommendations. 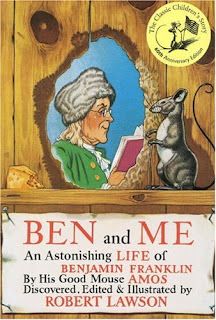 We are big fans of Ben Franklin books at our house and looking forward to a trip to our History Center exhibit on him. Oh my!! We're studying American History this summer and fall and these books would be perfect! Comment #2 because you are in my google reader. :) Just a note about Am. History. We're using Beautiful Feet which is literature based. Check 'em out just for the book list! oh these sound adorable. thanks for the giveaway. I loved those two books as a child and would love to share them with my students this next school year! And I follow via Google Reader. I loved these books as a kid and wouldn't mind rereading them and passing them on to my niece. That's an awesome giveaway! I do remember those books from my childhood, and I'll be sharing them with my kids eventually (when we get to American history in a couple of years). I'd love to add them to our home library! And I'm a follower, too! Thanks for the extra chance! Wow, I remember reading Ben and Me as a child. I haven't thought about it in years. It really is a good book. I'm a faithful subscriber/follower. Thanks for the extra chance to win. I would love to win these- history is one of our favorite reading genres! I am a follower of your blog- it is my source for reading suggestions! I had to break through the 50 comments for you! Woohoo! look at all these readers! What a fun look at history! I remember watching the cartoon of Ben and Me as a kid. And I'd love to get this book. And I'm going to be a regular reader as of today. I do love books that help us teach our children about history in an entertaining fashion! Great giveaway! I would really love to win these...what great looking books! Oh my...the memories. I had forgotten all about Ben & Me but know I liked reading it as a child. Thanks for the chance. Great giveaway! My little grandkids would be thrilled if Grandma could win them. Thanks for the chance! Oh, Yeah! Please enter me in this giveaway - Thanks! I follow on Google Reader & GFC. I'll take a chance at the books. Put me in. Ben and Me is a good book and was a good cartoon by Disney, too bad Mr. Revere and I wasn't adapted into a movie.